Italian painter and sculptor, born in Treviso Italy 11/04/1961. Currently, Piaia lives in Mindelheim 87719, City in Lower Allgäu Germany, where paints in his Art Studio in Nebelhornstr. 2. 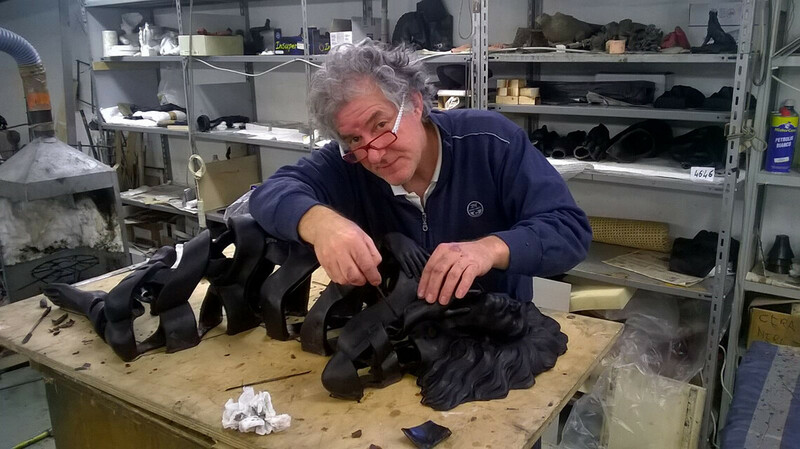 Also, the Master often returns to Pietrasanta (Italy) for bronze castings in the renowned foundries of the city. 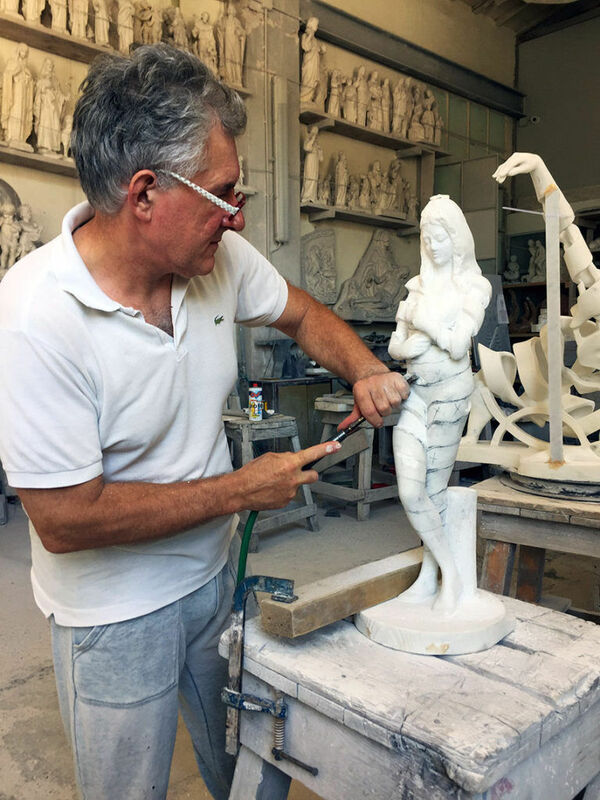 For sculpt his sculptures in precious Carrara marble is based in the Marble Studio Stagetti in Pietrasanta Via Martiri di S. Anna, 14. His works in Italy are in the Il Forte Arte Gallery in Forte dei Marmi Italy. Blue Period, with perfectionism, hyperrealism, transparencies, macchiaiolo impressionism (landscapes) and figurative, in particular a portraitist, he manages to capture the expressive essence of people both in canvas and in marble or bronze. 1975-’79. Yellow Period, with the Assurfivo (abstract, surreal, figurative) whose Piaia is movement leader and that place itself as innovation in contemporary art and as a new pictorial current, 1999-‘04. Yellow-Red Period of Assurfivo with transparencies and shadows, interpretative symbologies, in course at the present. In Roberto Piaia’s works appear references to ‘500 classcial school, interpreted in a Modern and Assurfivo viewpoint. These fascinating esoteric symbols are the signature of quadricromatic Piaia: never the same, reminiscent of an indecipherable language, which tells a story unknown to us, filling the images with mystery. From 2005 to 2008 he follows the teachings of Master Pardini from Padua. Later, in 2009/2012, he moves to Pietrasanta, a renowned Tuscan town famous for its foundries and development of artistic marbles. This allows him to sharpen the technique of clay modeling and carving directly onto the marble of Master Nicola Stagetti. As a result of this, he invented and modeled an innovative spiral shape in sculpture. Built using Carrara statuary marble, resina, and bronze casting through lost wax processes, the statues are created with the face, the hands and the feet, where the typical Piaia executional skills stand out. This world premier innovation consists in the creation of the body: the volume structure is built around a double helix which wraps around itself; with a “full” visual effect in which the form is underlined through a coil, while the void appears suddenly, leaving room for imagination. Biography. He also finds media success in 2007-’08 with an exhibition tour that touched the cities of Rome, Venice, Prague and Budapest. In those circumstances he brings a series of original works to symbolise the passage of time through the representation of the same model. Natalia Mesa Bush, portrays it every time differently depending on the month. In 2009 he officially entered the Gotha of the best Italian painters, having received from the Committee of the Critical Catalogue of Modern Art, (published by Mondadori), the classification of AIC (High Critical Interest). Following this, 2010 sees him reach a very important milestone. In the renowned “Palazzina delle Belle Arti” in Turin, he exhibits within a 1,500 square meter area an anthology of 180 works of his artistic production. The title of the exhibition is: Essenza al Femminile (Feminine Essence). The critic is curated by Angelo Mistrangelo, and the organization by Carmen De Guarda. Then in 2012 he approached his art the major Flemish and Dutch Masters of the Seventeenth Century found in the most prestigious museums in the world, the Louvre in Paris and the Rijksmuseum Amsterdam. Title of the exhibition: Stories of Art. Editors: Carmen De Guarda. In the House / Museum that gave birth to the illustrious painter G.B. Cima of Conegliano. Finally, in 2015, he exhibited his spiral statues in two important religious sites. Initially, in the wonderful arts complex of the Church of San Domenico located in the historic center of the City of Andria in Puglia. Then, in the foyer of the Sanctuary of San Pio da Pietrelcina, in San Giovanni Rotondo. (Italy). In 2016 he received the Free Time Award People of the Year, conferred to Piaia as best artist of the year, from the Republic of Bulgaria Embassy in Rome. One of the most important events of recent years is the showing of a spiral sculpture and an oil on canvas at the 54th Biennale Italian Pavilion in Venice in 2011. Where it received very favorable opinions. In 2017 he displayed a marble spiral sculpture at the Triennale di Arti Visive hosted at the Vittoriano Complex in Rome. 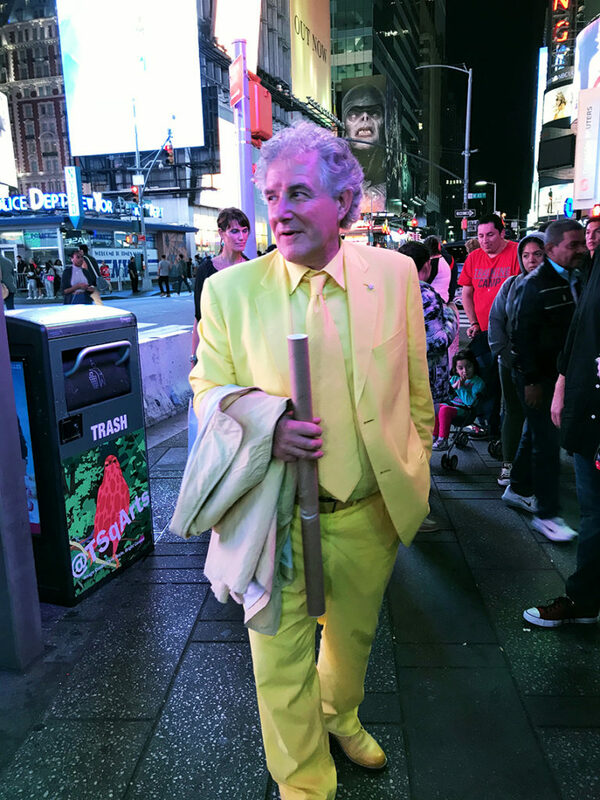 So, in October – November from the same year, he flies to New York-Chelsea for an exhibition setting in the important Amsterdam Museum Whitney Gallery. Finally, Roberto Piaia’s statue Over in bronze, steel and silver was selected by the organizers and exhibited from May 10th to 13th at the occasion of Versilia’s Yachting Rendez-vous 2018, a glamour Nautica event in Viareggio. Besides these, following exposure in homes of many Italian Institutes of Culture abroad, both in Europe and overseas. Among the most important: Sidney (Australia), 2010, Cologne (Germany) 2010, Munich (Germany) 2011, Stockholm (Germany) 2011. Concluding, his works have been exhibited in many Art Fairs. Among the latest, in February 2018 to Art Capital, Au Grand Palais in Paris. Natalia-January 2007 oil on canvas, 150×100 cm. Turin Sant’Agostino 11/11/08 (valuation €15/20.000) €13.800. The Junction 2007 oil on canvas, 50×90 cm. Vercelli Meeting Art 21/06/08 (valuation € 10.00) € 5.400. Misterious light 2008 oil on canvas, 100×50 cm. Vercelli Meeting Art 28/06/08 (valuation € 1.000) €3.360. The Cradle 2005 oil on canvas, 30×40 cm. Vercelli,Meeting Art, 14/03/2010 (valuation € 1.000) € 2.200. The serigraphy of the Seven Deadly Sins 30×20-20×30 Vercelli, Meeting Art 12/09/2010 (valuation €1.200) €.960. The Anger oil on canvas 60×60 Vercelli, Meeting Art 19/9/2010 (valuation € 2.000) €3.600. Rest in Assurfivo 2004 oil on canvas 50×70 cm. Vercelli Meeting Art 27/11/2011 (valuation € 1.500) €2.500. Dream 2000 oil on canvas 70×50 cm. San Agostino Torino 19/05/2015 Lot n°418 (valutation €3.000/4.000) € 2.000. Bust in memory of Police Inspector Rosario Sanarico. Naval base of Punta Pezzino, headquarters of the Divers State Police of La Spezia. 2006 – In the House Cima, Giorgio Segato critical. Published by La Matita d’Arte Veneta. 2007 – General Catalog of Works, Paolo Levi critical. Published by Cairo Mondadori. 2007 – Bacco Venere and Gioielli, Paolo Levi critical. 2010 – The Feminine Essence Carmen De Guarda and Angelo Mistrangelo criticals. Published by Cairo Mondadori. 2012 – Stories of Ligth, Roberto Piaia meets the Flemish and Dutch Masters of ‘600 Published by Faenza Group. Biography, Tg Rai 3, poi Veneto-Piemonte, anche Rai 3 Piemonte: Buongiornoregione, segue Tg2: Costume e Società, inoltre Canale 5: Verissimo, Rai 1: La Vita in Diretta, Tele studio (To), Rai 3 Piemonte: Settimanale Quarta Rete (To). 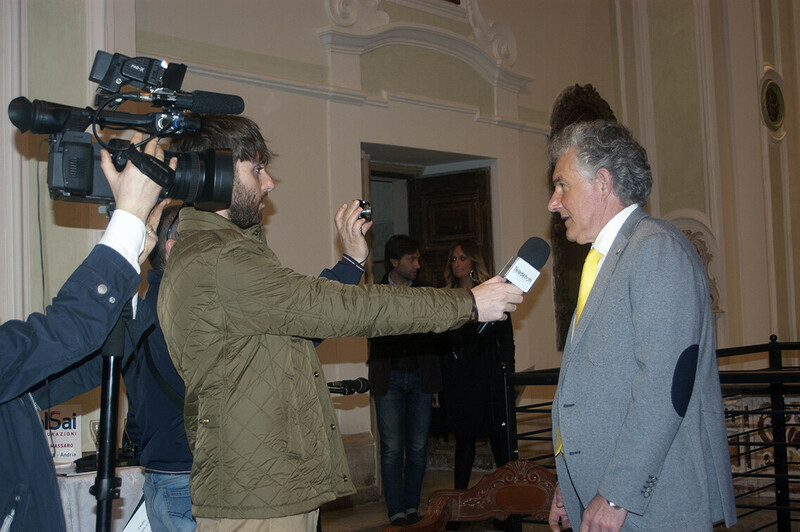 Grp Tg, Eden Tv (Treviso), Telenordest (Pd), Torino Web News, Tg Sveva, Tele Radio Padre Pio San Giovanni Rotondo, Tele Norba. Biography, first of all, www.2 night.it, La mescolanza.it, Freeonline.it, Eventiaroma.it, Il Gazzettino.it, Cronacaqui.it. then, Il Messaggero.it, WindPress.it, Ifatti.com, ItalyBanner.it, Il tempo.it, arsvalue.com, next: exibart.com, undo.net, tafter.it, teknemedia.net, continued: contemporarytorinopiemonte.it, torino,zero.eu, futura.unito.it, artein.org, kulone.com, newspettacolo.com, comune.torino.it, next ilgiornaledellarte.com, artshow.it, comune.chieri.to.it, pescara.2night.it, virgilio.it, 123people.it, spaziotorino.it, iomagazine.eu, ciao.it, deastore.com, piemontemagazine.it, arteinforma.it, , expoartcc.ning.com, libero.it, freeonline.it, linkarte.it, cercarte.it, comunicati-stampa.it. Bacco Venere e Gioielli Roma. Insend by Roberto Piaia. Atelier Roberto Piaia Sernaglia della Battaglia. Then Twn N°119 as Roberto Piaia – The Feminine Essence – Torino Rp.